A central figure in any bathroom interior would definitely be the faucet. Faucets come in all shapes and sizes nowadays. It offers convenience and allows for better water conversation in homes. Faucets have evolved throughout the years in terms of design. In this article, we will be taking a look at the best center-set bathroom faucets on the market today. Polished brass is a classic option that adds a touch of class and luxury to your bathroom. Of course, before we head to the main event we need to understand the little quirks and factors that define a high-quality faucet. Understanding the features, overall aesthetic compatibility, and budget are all important elements to consider. Beginners might think that there is only one kind of faucet but the truth is there is a handful to choose from. Knowing the differences between each type of faucet is important when choosing one for your home. Let us run down the various types of faucets as well as their key traits, shall we? This, usually, single lever faucet connects both the spout and mixing handles into one that needs for only one drilled sinkhole. The single-hole faucet is recommended for those with smaller sinks. Its simplistic and minimalistic design makes it a great choice for homes with a modern aesthetic. Comprised of three pieces: spout and two handles. This is larger than other faucet types as there is usually an 8-inch distance between handles. However, there are more compact versions available known as Mini-spread mount faucets. This shortens the distance between the handle by 4-inches. This type of faucet has steadily risen in popularity over the years. Its space-saving quality is probably its biggest selling point. It requires longer spouts though in order to properly be used with sinks. This type of faucet is compatible with three-hole sinks. You can choose between the single lever or two handle mounts for this type of faucet. The Center-set faucet is often the most popular choice as its design allows it to be compatible with almost all types of bathroom sinks. Hold on to your seats as this aspect of faucets can be quite dizzying with its array of choices. The good news is that modern finishes now utilize modern protective technology that offers long-lasting protection on your faucet at an affordable rate. Check the showroom to see how the finish looks when on display. This should help you pinpoint which finish you prefer. Plan out the overall finish of your bathroom. Take into consideration other hardware. Make sure that each complements each other aesthetically or are the same finish. Remember that polished brass finishes require regular maintenance and proper care to help them remain shiny. Brushed finish faucets can easily hide water spots which is something to mull over if you have children at home as they can be a tad bit messy. 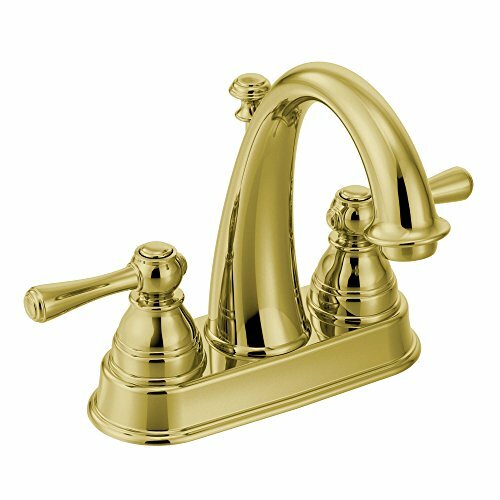 Now that you have a good understanding of faucet types as well as finishes, I’ll be giving a list of highly rated two handle centerset polished brass bathroom faucets. Why this type of faucet you might ask? Simply put, this type is the most common and most popular type found in most households. Chances are, your bathroom is already designed to accommodate this type of faucet. Two handle faucets are also great in terms of practicality. They can better control water temperature as well as water flow rate. The two-handle design also allows you to use it even if one handle starts to have a leak. Delta Faucet has always presented some top-quality products over the years and this one is no exception. It features certification from WaterSense which means it is designed for optimum water conservation. The faucet also comes with matching drain ready for assembly. It is also approved by the Americans with Disabilities Act. It utilizes a 3-hole and 4-inch installation. Once assembled, the Delta Faucet Windemere has an overall dimension of 5 to 7/8 inches x 6 to 1/32 inches x 9 ½ inches (H x D x W). As stated, this has polished brass finish making it easier to clean and maintain. Sturdy feel with its solid brass construction and material. Easy to install once you have configured the drain lift properly. The drain control shaft is strangely bent. A weird design choice, to say the least. 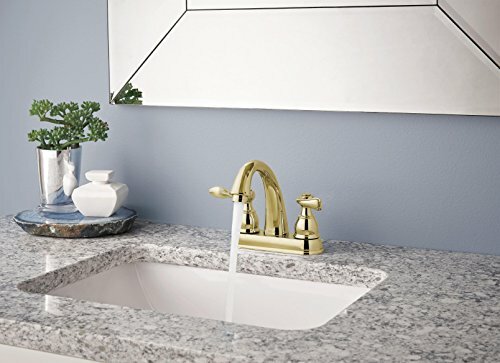 If you have the budget and want something high end, I suggest you take a look at what Moen has to offer with the Kingsley Two Handle Centerset Faucet. As it features the two-handle design, you can expect it to offer significantly better control in terms of water flow and temperature control. It is designed using the 3-hole mount with a 4-inch design for easier installation. If you are not yet familiar with Moen, the company is known for high-end bathroom faucets. The company was founded in 1937 by Al Moen and has been making quality faucets ever since. After scalding his hands on the hot water coming out of an old-fashioned two-handle faucet, Moen set out to come up with a better and safer faucet. His efforts gave birth to the first single handled faucet. The rest is history, while they continue to make two handled faucets like this one reviewed here, Moen was the inventor of the now common single handled version we see all over the world. In 1997, Moen introduced their proprietary and revolutionary LifeShine non-tarnish finish. As for the finish, it has polished brass finish using LifeShine technology for optimum longevity. LifeShine polish is known to prevent corrosion for decades. The faucet also meets the standards of WaterSense in water flow conservation. As an added bonus, this faucet also comes with a limited lifetime warranty from Moen. Made from high-grade material and feels sturdy. Polished brass finish by LifeShine guarantees longevity. A light touch is needed for turning it on and off. While I am not all for choosing the cheapest products when it comes to essential household items, if you absolutely need to save cash in regards to your bathroom faucet then I recommend you check out this one from Kingston. It finds a great balance between affordability and quality. This would also be a good pick for a rental property where you want a functional faucet since property owners know that fixtures in rentals get abused more and suffer more wear and tear. 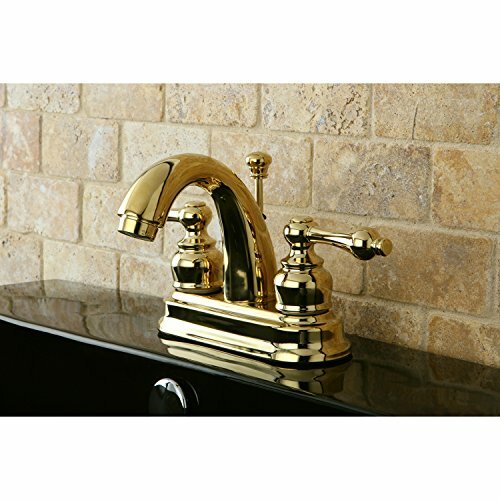 This faucet by Kingston features solid brass construction for durability. It also comes with a DuraSeal washer-less cartridge and a 4-inches center-set installation. In terms of water conservation capability, it has a maximum of 1.2 GPM/4.5 LPM water flow rate at 60 psi which is the standard ASME rating. The faucet also meets the standards of the California Energy Commission. Rudimentary features with high-grade quality construction at a reasonable price. Easy to install. Will take you an average of 30 minutes to install properly. Good budget pick for low cost bathroom makeovers, rental properties or starter homes. The polished brass finish has a slightly darker brown appearance than what is in the image. How to select new bathroom faucet. So… you have decided that you want to buy a new bathroom faucet and now you’re overwhelmed by a large number of options and features? You can relax and keep on reading because we have prepared all of the information you’ll need before choosing a new bathroom sink faucet. Before we discuss different types of faucets, there are some questions that you’ll need to answer. Faucets can differ in prices to a great extent anywhere from $20 from the lowest budget options to over $1,000 for highly stylized or ornate detailed nickle or brass. The price will depend on the material, size, and features. Deciding on a budget before going to the store can immensely help you save money. Believe it or not, choosing a new faucet can be as exciting as choosing a new car and that is why you need to set boundaries. Decide on a price range and keep that in mind while choosing a new faucet. Are you buying a new sink or using the old one? When you are buying a new sink as well, it is easier to choose the faucet since the hole configuration determines which type of faucet will fit (single hole, center set or wide spread) and can choose a sink and a faucet that go together. 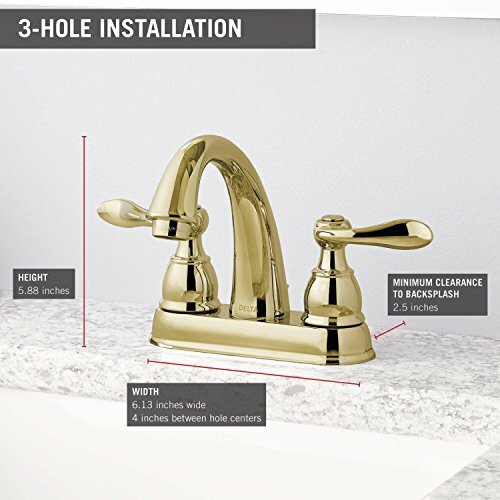 If you want to install a new faucet on the sink that you already have, you’ll need to make sure that the new faucet will fit the pre-existing holes. Although you do have the option to use a deck plate to cover the old holes, you just need to find one that will properly cover the existing holes…and that matches the faucet finish as it will look a little strange to have mis-matching finished (chrome deck plate with a satin nickle faucet). It would be helpful to take pictures of your sink and measure it, before going to the store. Here is a useful video showing an overview of how to install a new faucet on an existing sink as well as tips to installing a new faucet and sink at the same time. Single-hole faucets can have a single handle or two handles, but there is only one opening on the sink. The handles and the spout are coming out of the same pipe that’s going into the sink. Center-set faucets usually have handles that are 4 inches apart and are made for sinks with three holes. The spout and handles are usually located on a single base unit. Widespread faucets are also made for sinks with three holes but include three separate pieces- two handles and a spout. Handles are usually 6 to 16 inches apart. Wall mount faucets are not connected to the sink- they are mounted to the wall. If you are planning to switch from sink-mount to wall-mount faucets, make sure to check with your contractor if your idea is compatible with the water supply lines in your bathroom. Vessel faucets are usually one-hole faucets that contain one tall spout and a handle that sits right on top of it. Vessel faucets usually go with bowl-like faucets. Control options- Most of the popular faucet features are related to its control options. If you are a fan of modern bathroom technology, you might opt for a motion-activated faucet, that turns on when you place your hand under the spout. Another option is a touch-activated faucet, that doesn’t require you to handle knobs or handles. It can be activated by taping the top of the faucet. Material- Faucets are usually made of brass, due to its resistance to corrosion and calcification. With that said, there are many finish options on the market, like chrome, titanium, nickel and, for the more luxurious folks- gold! Self-sanitizing- Believe it or not, you can make the nasty cleaning process easier. You can opt for an ozone-activated antibacterial faucet. This type of faucet injects a stream of ozone into the water stream, which can be very effective in killing germs. Laminar flow- faucets with aerators provide water streams with lighter flow. Bubbles make the water appear white. Another advantage of laminar flow faucets is that the flow is created by dozens of tiny sheets of water, which creates a solid stream and prevents splashing. Now that we’ve discussed possible faucet features, we can move on to different types of faucets, regarding the mounting type. This might be the most important factor to consider when choosing a new faucet, as not all faucet types work with every sink. Ball faucet– this is the most commonly used faucet type. They can be identified by looking at handles. Ball faucets have a single handle, with a ball at its base. The ball rotates when you move the handle and regulates the amount of incoming water. Ball faucets use an older design that is very likely to leak since there is only one moving handle and the ball can quickly wear out. Disc faucet– it looks similar to a ball faucet, but there is a difference in how they function. Disc faucets have a cylindrical shaped body that they turn on, which allows them to rotate from side to side. When discs rotate, they regulate the flow of hot and cold water- blocking water or allowing it to pass through. Compression faucet– this type of faucet always has 2 handles. It works by means of a stem that falls and rises to close and open the water’s passageway. Compression faucets also use an older design and are very prone to different problems. Cartridge faucet– it controls the flow of water using a rubber ring inside a cylindrical cartridge. They can sometimes look similar to compression faucets, but the difference is they move smoothly and evenly. They also do not become tighter or looser when they are being turned. Cartridge faucets are extremely reliable, especially when equipped with a brass cartridge. As you can see, there are many different factors to consider when choosing a bathroom faucet. In this article, we discussed the importance of setting a budget and deciding on desired features before you go to the store. Moving forward, we explained faucet types based on the mounting type and the number of holes in the sink. Finally, we explained the difference between the four valve types and their quality and reliability.